Gorgeous historic house on organic farm. Sleeps up to 6. Property 2: Gorgeous historic house on organic farm. Sleeps up to 6. Farmhouse 7 Miles From Loch Ness, In a Quiet Glen. Property 3: Farmhouse 7 Miles From Loch Ness, In a Quiet Glen. An imposing 17th Century Farmhouse with a wealth of character features throughout near Broadway. Property 20: An imposing 17th Century Farmhouse with a wealth of character features throughout near Broadway. A lovely traditional farmhouse in a rural location. 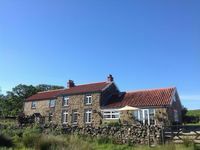 Property 38: A lovely traditional farmhouse in a rural location. The Farm House is lovely, homely and comfortable and had everything necessary for our week's holiday. We could park three big cars within the gated courtyard. It is in an ideal location to visit York, Filey, Whitby &amp; Scarborough. We enjoyed a family cycle along the Cinder Path from Robin Hood's Bay to Whitby and back. We would recommend it as a place to stay. On behalf of the hen party I wanted to say a big thank you to Michelle the owner of this property as we had a fantastic weekend staying in this wonderful house! Michelle was so helpful in the course of arranging this stay, she was waiting to meet us when we arrived with a lovely box of goodies and even went looking for one car that got lost en route! Beautiful rooms with fantastic views over the moors, exceptionally clean and the kitchen was so well equipped! It's absolutely perfect for a large group and we will definitely recommend it.